Rally Preparation Services is pleased to offer for sale this wonderful little Bonneville Sebring Sprite classic rally car. It is believed to be the only example with a FIA historic technical passport and has been with the same owner for 27 years. The Healey Sprite was introduced in 1958 as a ‘joie de vivre’ low cost sports car to complement the successful MGA. Designed by Donald Healey and his sons utilising many existing BMC components, the car was an instant success and gained the affectionate moniker ‘Frogeye’ due to the prominent headlamps. (Incidentally, the headlamps were originally conceived as retractable but this feature was scrapped on the grounds of cost). Light, small and nimble, the car soon found its way into competition, and the works entry of John Sprinzel immediately took a class win on the 1958 Alpine Rally. Fast is good. Faster is better. Healey and Sprinzel set to work to improve the Sprite fitting disc brakes and later a revised front bodywork to produce the Sebring Sprite. Although never produced by BMC, it is a model recognised in its own right by the FIA. Meanwhile back in Abingdon, the BMC competitions department set about developing a supercharged version to capture land speed records at the famous Bonneville Salt Flats. Flushed with success, a supercharger was subsequently offered as a tuning option and hence the supercharged Bonneville was subsequently homologated in 1962. This cracking classic rally car has been loved, developed and campaigned by its current owner for 27 years. 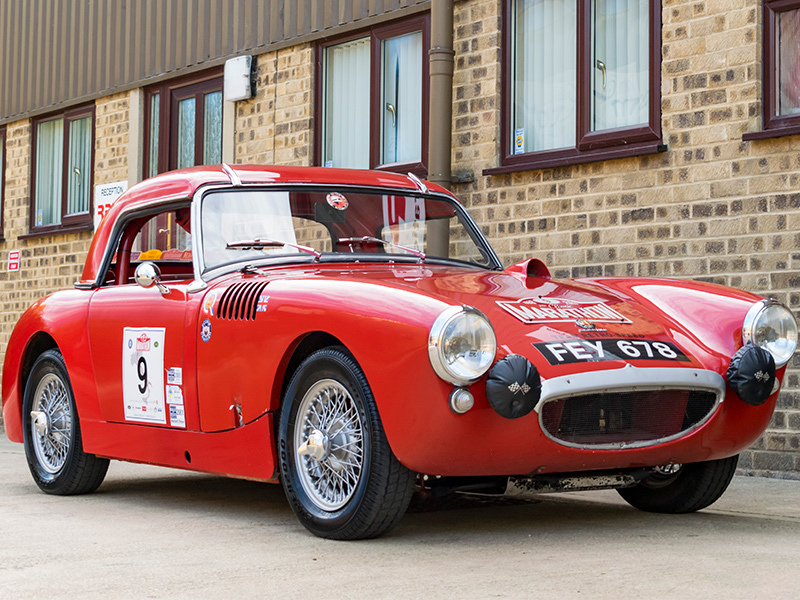 With approximately 20 major rallies under the tyres including two entries on the Monte Carlo Historique, two on the Classic Marathons, Liege- Rome-Liege, two outings on The Rally of the Tests, various class wins and even a concours trophy, this Bonneville Sprite has an impressive sporting pedigree. This is a working competition car with ‘all the right bits, comes with an extensive documentation file, membership of a select club and is only available due to the owner being a little less ‘spritely’ than he was. All viewings welcomed by appointment only at Rally Preparation Services. Correct smooth case gearbox with needle roller bearings. Straight cut close ratio gear kit. Uprated front lever arm dampers and springs with negative camber kit. Lockheed “Thin” front discs & uprated rear drums. Works type 9 gallon fuel tank with guard. Works type glass fibre top. Williams & Pritchard Sebring front.